This change would do justice to UBC President Wesbrook’s anticipation in 1916 that UBC would be the “people’s University,” which could hardly be translated into a condescending corporate brand or real estate agency. Or could it? Each time Admin chants Tuum Est, an entire history of bad Latin is recalled in mistranslation. In context of its initial translation from Greek to the Latin Lord’s Prayer (i.e., Pater Noster) and later in Jerome’s translation of the Book of Jeremiah, tuum est refers to deference and reverence to the power, right, and glory of God’s Kingdom. In Horace’s Melpomene, it is rendered as reverent debt and duty to the muse. 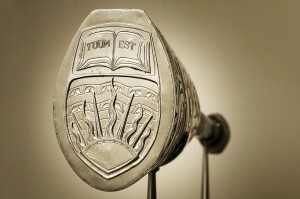 A decade or so after UBC’s first President uttered Tuum Est in the 1916 Invocation, the motto was secularized with relative hubris: “It is Up to You.” Or alternatively and eventually, as in the classic Seinfeld episode, to “Master of my domain.” By the 1930s and 40s, this was perfect for advertising Felix Dry Ginger Ale. As the ad went, Tuum Est “can well be carried into business.” Nowadays, we notice that the Board and Admin are giving lip service– labellum officium or otherwise hypocrisis in Latin– to the meaning of the motto.